Science in Your Home…and Everywhere Else Too! It’s been known for quite a while that colors affect your mind and emotional state at the subconscious level. Reds, yellow and oranges have a cheering effect on you; on the other hand, blues, greens and purples have a calming effect but they can also make you feel sad. There’s a lot of research that’s been done on this subject. If you’re interested in knowing more, The Teaching Company has a cool lecture series on this topic. There are also a ton of articles on the internet about this too. Color psychology is quite complex. It goes beyond just the simple color-emotion correlations you see in popular psychology articles. Your mind has a built-in color bias for familiar objects that can play havoc with your other senses. Here’s an example of how color affects taste. You may have noticed that sometimes skim milk can have a blue cast. That blue color is due to light scattering in a colloid known as the Tyndall effect. It’s what happens when you take the fat particles out of milk. We’ll save the Tyndall effect for another post. What’s important here is that for most people, the blue tint makes skim milk taste worse. A lot of milk factories add milk solids to skin milk to make it whiter. Your brain tells you that milk is supposed to be white, and white skim milk will taste better than blueish skim milk. No, really. Your brain works like this. Don’t believe me? The green eggs experiment is a excellent example of this color bias effect on taste. He took these egg types, scrambled them up and fed them to taste testers. His tasters liked the pasture-fed eggs and the omega-3 eggs the best and grocery-store eggs the least. Lopez-Alt is a sharp guy. He did not stop there because he noticed another variable was involved. That variable was color. The color of the eggs also correlated with taste preference. Grocery-store eggs had the palest yolks and made pale scrambled eggs. The pasture-fed and omega-3 eggs had bright-orange yolks and richly-colored orange-yellow scrambled eggs. The color of yolks is due to differences in diet. For both pasture-fed chickens and commercial omega-3 organic chickens, their diets include things that enrich the color of egg yolks towards deep orange. Lopez-Alt recognized that he needed to test if color affected taste perceptions. So he set up a new experiment. He used all of his egg types from the first experiment; but this time, he dyed all the scrambled eggs a uniform green. When his taste testers tried the green eggs, they had no clear taste preference. The dyed eggs all tasted the same despite their different origins. It was clear that the color of eggs in the first experiment affected their perceived taste. When color was equalized, the eggs had equal taste. The minds of the tasters preferred the color of the more-orange eggs and fooled the taste buds accordingly. J. Kenji Lopez-Alt, The Food Lab, W. W. Norton & Co., NY, 2015, ISBN978-0-393-08108-4, pp. 93-94. 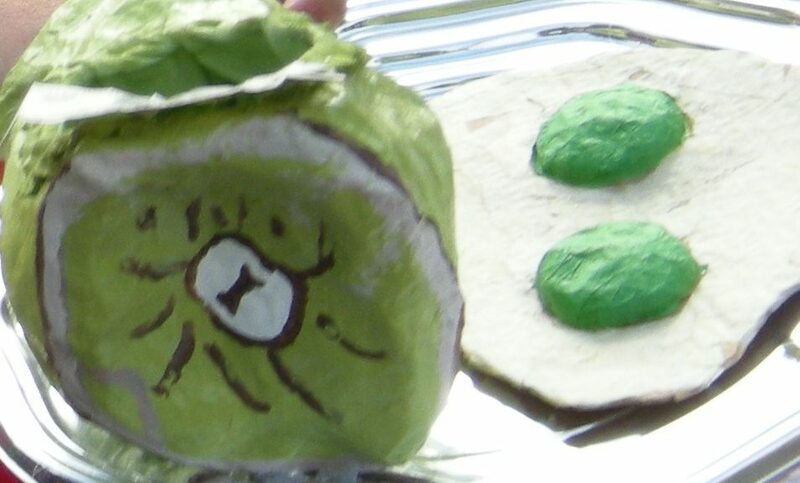 Today’s banner image of mock green eggs and ham is by Joe Mabel, 2009, CC BY-SA 3.0 via Wikimedia Commons.